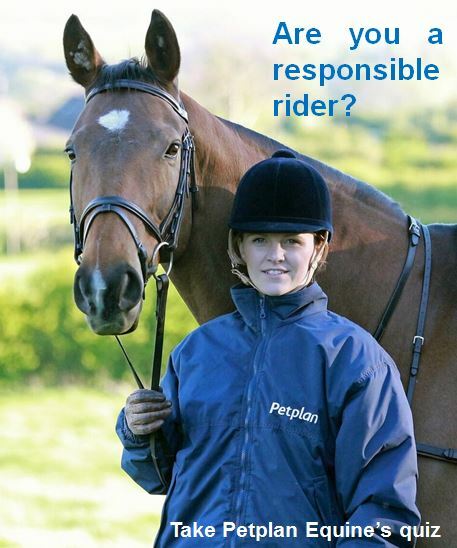 According to early results of a Responsible Riders quiz www.petplanequine.co.uk/responsibleriders being conducted by specialist equine insurer Petplan Equine, UK horse owners and riders are, principally, a responsible lot. Respondents to the quiz in most instances chose the most conscientious answer demonstrating a high level of understanding about what is important when it comes to their horses’ health and wellbeing. But that’s not to say they always get it all right all of the time as the results – some of which are surprising – show. Petplan Equine, one of the UK’s leading specialist equine insurance providers, has been providing cover for horses for more than 25 years and works closely with vets and other equine experts to promote responsible horse ownership. The company developed the Responsible Riders quiz to draw to owners’ attention to and get them thinking about their own approach to good management practices. More than 2,500 people have taken the multiple choice online quiz since it was launched on the Petplan Equine trade stand at the Hickstead Derby last month with the majority choosing the ‘right’ answer in almost all cases. There were however exceptions, the most notable of which was question eight. This asked respondents what they would do in the event that their normally well-behaved horse began to nap and buck when ridden. Only 51% chose the correct answer, which involved calling the vet to check there was nothing causing him pain. A surprising 48% opted for “check him for obvious signs of discomfort and resolve to have his saddle checked ‘at some point’”. Other questions where there was a higher percentage of respondents preferring the ‘wait and see’ approach, included those related to coughing, reluctance to jump, a loose shoe and even when to check for Ragwort. While 100% of respondents were aware of the dangerous weed Ragwort, 27% chose response C: “Pull it out of the ground immediately. If it is ragwort then it’s an illegal dangerous weed that causes liver damage and you don’t want it spreading. You would also check the rest of the field later.” While eliminating the weed is vital it is important to wear gloves and extract it by its roots with a rag fork; and, if Ragwort is spotted, the rest of the field needs to be checked immediately – not later – as it is highly toxic and spreads rapidly. In most instances respondents demonstrated that courtesy to others with whom they came in contact is important to them although 6% said they would take a horse that was “excitable in company” on a sponsored ride and “hope that other riders would be sensible enough to keep out of their way”. Many horses can ‘light up’ when in company so it is always advisable to introduce an excitable horse to other horses in a safe environment several times so they are calmer before joining a sponsored or fun ride and then, go when you know there are likely to be fewer horses on the courselike right at the beginning or end of the day. Visitors to the Petplan Equine stand at Longines Royal International Horse Show (28th July to 2nd August) will have the opportunity to take a shortened version of the quiz and be in the running to win a Responsible Riders kit worth £150.00. “At Petplan Equine we understand first-hand how rewarding horse riding and ownership can be and from experience we think most horses enjoy the company of their human companions. 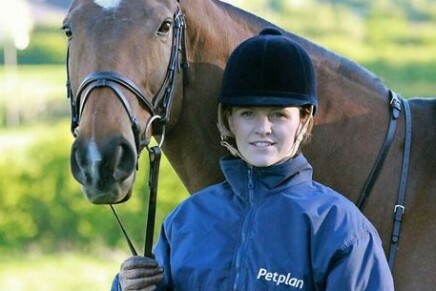 We’re encouraging as many riders as possible to take the Petplan Equine Responsible Rider quiz to find out how their attitude towards their horse’s health and welfare rates in helping make sure their horses are happy and healthy”, says Charlotte Collyer. Ride-Away this spring and summer- new catalogue available now!